Watch the company’s stock price move in real time here. 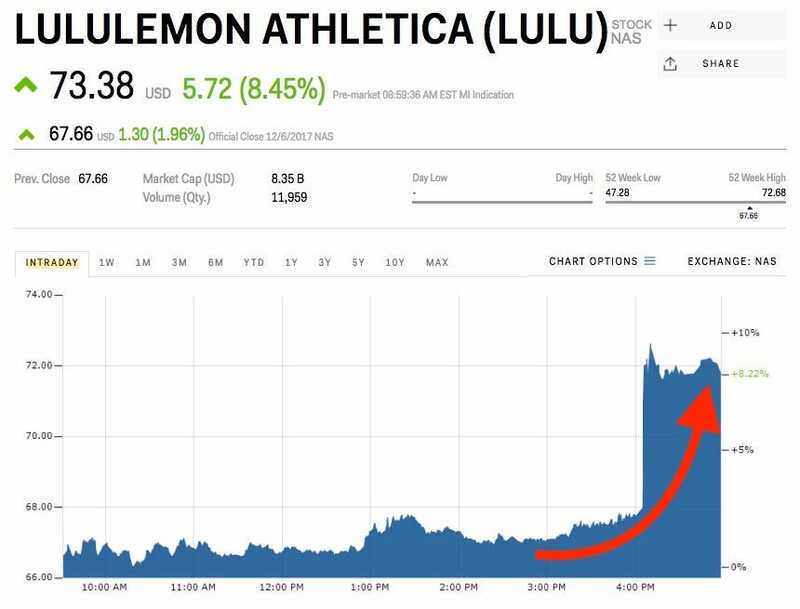 Lululemon released its third-quarter earnings after Wednesday’s closing bell and beat on the top and bottom lines, sending shares higher by 8.11% to $US73.15 apiece. The company reported adjusted earnings of $US0.56, topping the Wall Street estimate of $US0.52. Revenue of $US619 million was up 14% versus a year ago. After reporting its earnings beat, Lululemon raised its full-year earnings guidance from a range between $US2.35 to $US2.42 to its new range of $US2.45 to $US2.48. “LULU’s strong 3Q and conservative 4Q outlook serve as a proofpoint that the company’s product innovation, stores, and digital experience focuses can push the brand towards $US4 billion in sales by 2020 from $US2.6 billion today despite a normalizing athletic category,” Tunick said in a note to clients. 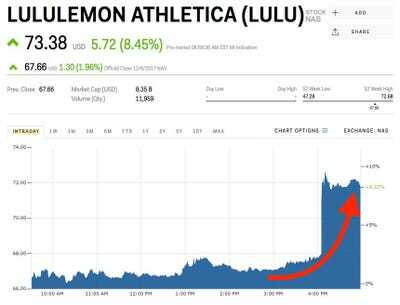 Tunick rates Lululemon an outperform with a price target of $US77, which is 4.9% higher than the company’s current price.